You are here: Home / Articles / What Size Tacoma/4Runner Shocks Do You Need? When it comes to performance off-road shocks for Tacoma’s and 4Runners it can be difficult to choose which shocks are right for your Toyota and your type of off-roading. In the past you had to choose which shock would give you the ride quality you wanted, and you’d put up with the quality (or vise versa). But with the advent of AccuTune Equations, you can now get any shock custom tuned for your Toyota, your weight, your terrain, and your preferences. So now you can choose which brand, size, and configuration you want, and still get the ride quality you’re looking for. With that in mind there are now three things you want to consider when choosing shocks: ability to make proper damping force, heat capacity, and durability. Why Does Damping Force Matter on Tacoma Shocks? Damping force is the amount of force produced by a shock at a given shaft velocity. Shocks make damping force when oil flows through ports in a piston and is restricted by round disks that act as springs. When shock diameter increases so does the amount of oil that has to flow through the piston, so naturally the damping forces increase. As a result there are ranges of damping where each size shock is most adequately sized. The front coilovers on Tacoma’s and 4Runners are mounted about half way up the a-arm, which means the shocks only move half the speed of the wheel, and half the speed means half the force. Being mounted half way up the lower control arm also means that only half the damping force created goes to the wheel. So on the front of Toyota 4×4’s the front shocks only deliver 25% as much damping force to the wheel as if the shock had been mounted there. This means that front Tacoma and 4Runner shocks need to make approximately four times more damping than the rear shocks. Four times more damping force means that 2.0 shocks really aren’t big enough. For the purpose of completeness, there are tricks that can be done to valving to make shocks stiffer than traditional methods allow, and there are ways to design shocks which make them naturally stiffer. But aftermarket 2.0 shocks are ultimately not designed to make the forces required for the front of a Tacoma or 4Runner. Yes, we can make it work, but the when shocks are made to be stiffer than they naturally want to be it can lead to harshness are reduced life span. For this reason many undersized shocks are very soft and give you a bouncy, Cadillac like ride. Serious off-road driving requires serious damping forces, shocks that are too soft will bottom out frequently and will be bouncy off-road. In the front 2.0 shocks are adequate for stock weight Toyotas doing on-road driving and slow speed off-roading such as hunting, fishing, and slower speed trail riding. 2.5 shocks are necessary for heavier Toyotas, and for high speed such as fire roads and desert running. In the rear 2.0 shocks provide enough damping force for stock weight Tacoma’s and 4Runner’s doing everything from on-road driving up to pre-running. With the addition of full overland gear such as skids, bumpers, and RTT it is necessary to step up to 2.5 shocks in the rear as well. What is Heat Capacity and When Does it Matter? Heat capacity is the ability for a shock to withstand rigorous off-road driving without fading, leaking, or substantially shortening their life span. When looking at heat capacity two things must be considered: amount of oil and speed heat dissipation. The quantity of oil inside a shock relates to how much heat it can absorb, and heat dissipation is how quickly it can rid its self of heat. Larger diameter shocks hold more oil and have more surface area so it’s no secret they have better heat capacity. 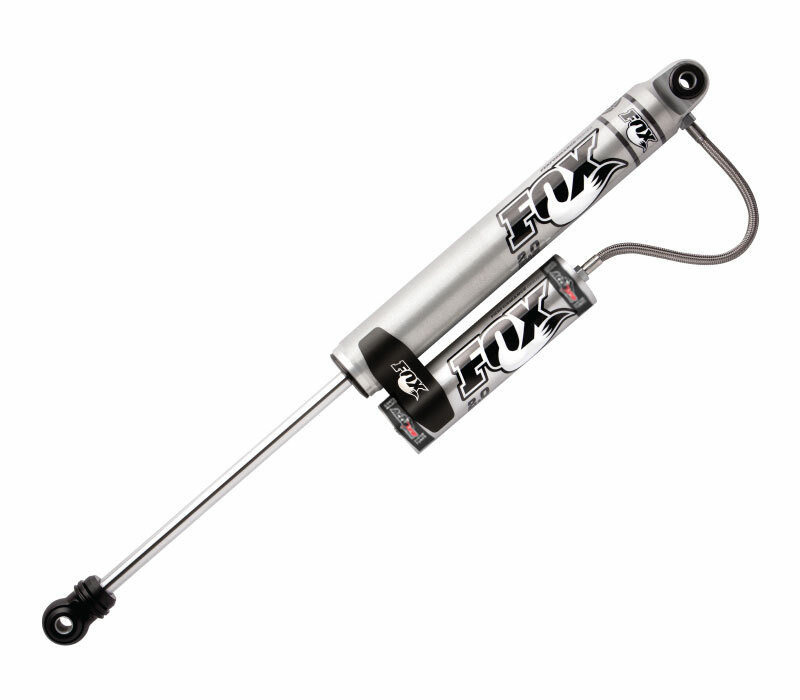 But Fox and Icon do make Aluminum Bodies 2.0’s with small 5/8″ diameter piston rods, which help them hold more oil, and dissipate heat more quickly. When is Heat Capacity a Factor? Heat capacity becomes a factor when running rough roads at speed for long periods of time. As an example washboard road causes extremely fast movement of the shocks which generate a lot of heat. On the other end of the size spectrum, large whoops also generate a lot of heat when run at speed because the shock is using its full stroke very rapidly. Any terrain which causes rapid wheel movement will be demanding on the shocks. Tacoma’s and 4Runners work well with 2.0 shocks for slow speed off-roading and about 5 minutes of hard run time on demanding terrain. The five minute run time is a rule of thumb and assumes the terrain is constantly rough and the speed is constantly high. With the increased oil capacity 2.5’s are good for about 15 minutes of hard run time before they start fading and life span gets shortened. 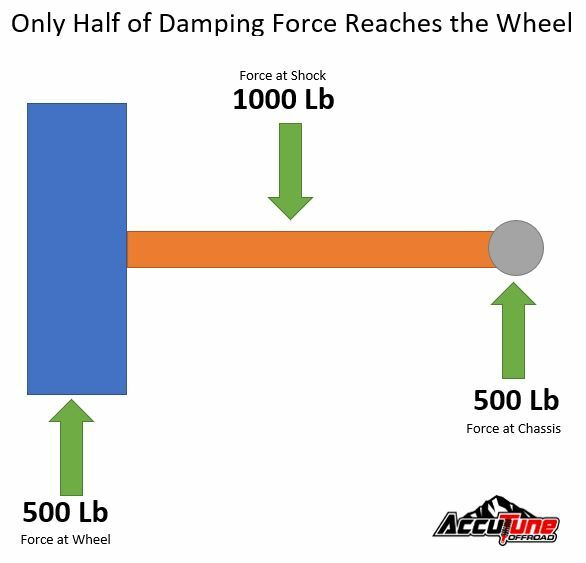 Adding weight further reduces run time because it requires more damping which creates more heat. If you’re a light wheeler out exploring the backwoods with your 4Runner 2.0’s will handle the heat. If you’re blasting the dunes for an afternoon in your Tacoma then you should step up to 2.5’s for their ability to handle the heat. 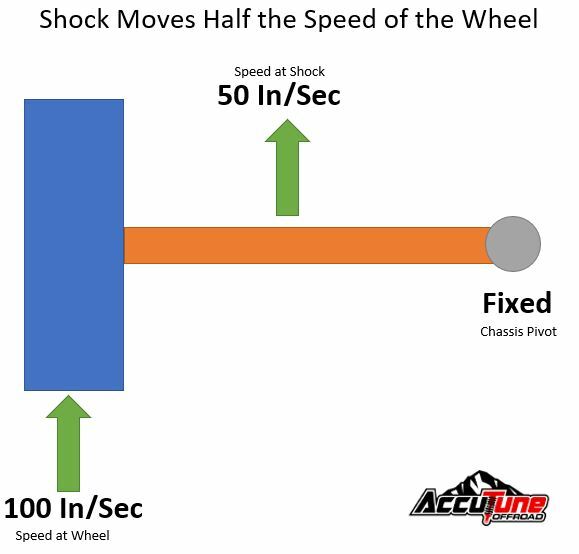 Shock durability is dictated by the size of the shock, quality of material, and reservoir configuration. As discussed previously, larger shocks naturally make more force. Part of this is because damping is directly related to the cross sectional area, so larger diameter shocks operate at lower pressures. Lower pressures are easier on seals and increase the shocks life cycle. In addition larger shocks are less likely to reach temperatures past their designed operating range. Running a shock over temp doesn’t always make them fail right away, but it does harden the rubber seals and reduces the lubricity of oil, which leads to a shorter life span. We aren’t going to dive into the specifics of each brand here, but there are differences between the quality of materials used in each brand. 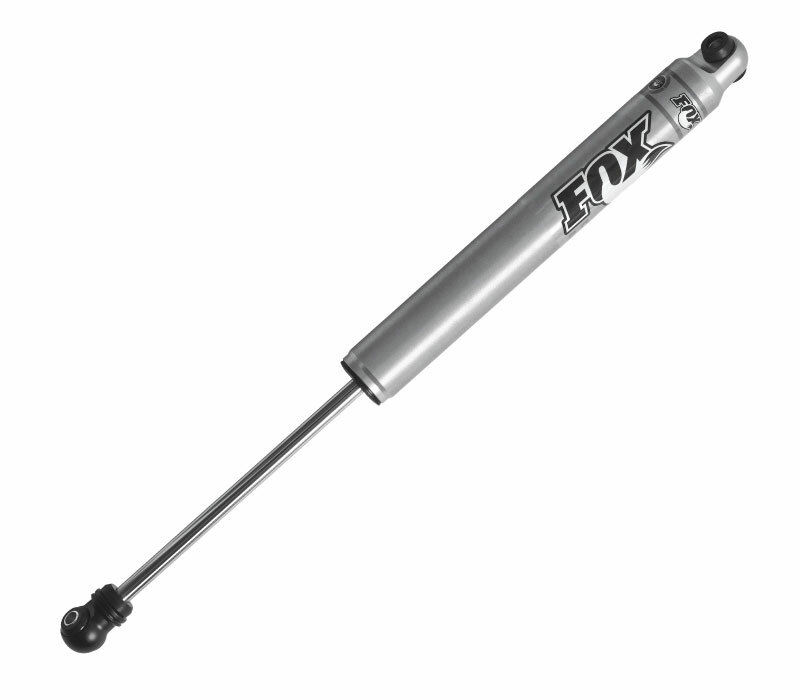 See our Fox vs King: 2.0 Coilover Shock Comparison article for more info. While it’s true that remote reservoirs do increase oil volume and thereby increase cooling and heat capacity, that’s not their primary purpose. The primary purpose of remote reservoirs is to reduce the shocks operating pressure. As the shaft goes into the shock body the volume is displaced and the nitrogen gas charge increases in pressure. Higher pressures drastically increase the friction and wear on seals, as well as reducing the ride quality. (note that nitrogen pressure is not a tuneable element of the shock, do not change from the manufacturers recommended pressure). 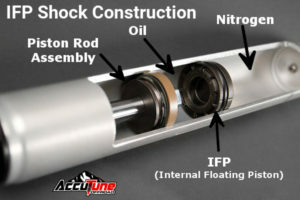 In an IFP shock there is a single cylinder containing the piston rod, oil, nitrogen, and Internal Floating Piston (IFP – which separates the oil & nitrogen). All of these items are in line which doesn’t leave much room for nitrogen, meaning the original 200 psi charge may exceed 600 psi when fully compressed. The 600 psi is actually not too bad, but once the shock starts heating up the oil expands and the pressures can sky rocket. The inline construction of IFP shocks is often done on an assembly machine which also seals the shocks, making them a sealed unit which can’t be rebuilt. Remote reservoir shocks have a separate cylinder just for holding nitrogen, which has substantially more volume. As a result the pressure is very consistent, even when the shocks get hot. The remote reservoir design requires separate nitrogen charging, making them rebuildable. There is a whole article coming about this topic, so stay tuned. **Note in these pictures, the nitrogen space in the IFP is usually much smaller, and the nitrogen space in the Remote Reservoir is usually much larger (90% of the reservoir). Because these shocks were cut away the parts have been artificially moved. IFP shocks are a great budget solution for street use and slow speed off-roading but are not suitable for high speed use on Tacoma’s and 4Runner’s because the method of construction does not make them durable enough. Remote Reservoir shocks provide better ride quality and better long term durability than IFP shocks, and are well suited to hard use on demanding terrain. What Do Compression Adjusters Do & Do I Need Them? 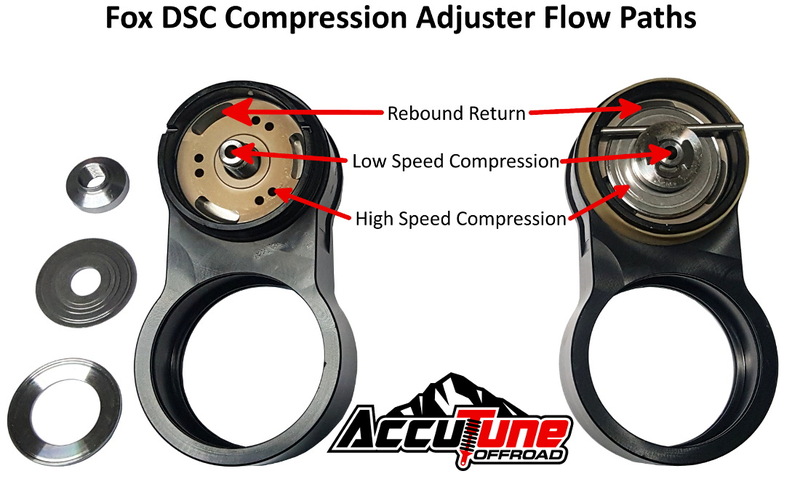 There are three types of compression adjusters on the market, low speed, high speed, and mid speed. 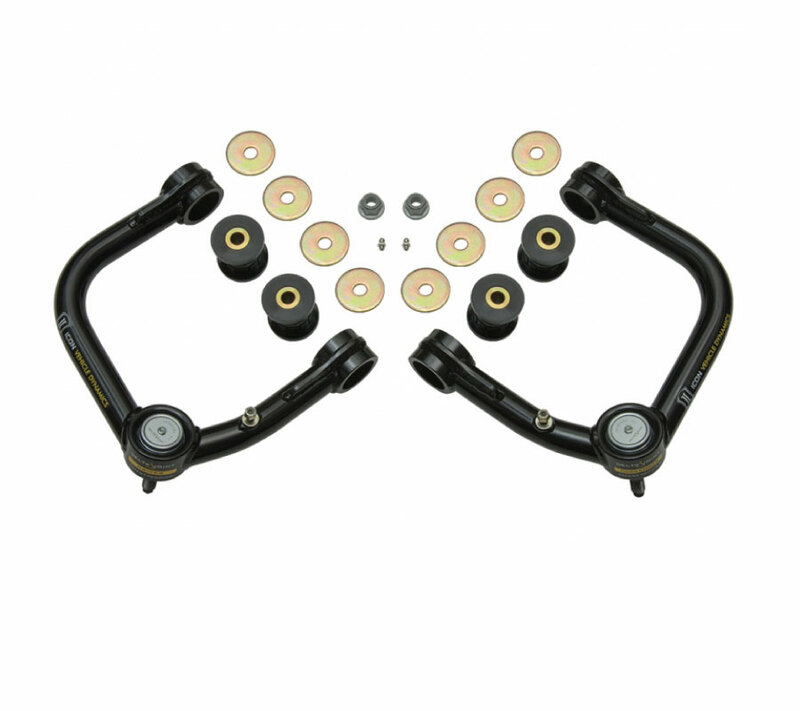 Each one is designed to tune a specific performance characteristic of the vehicle. Low speed compression adjusters tune handling, g-out, and slow speed bottom out performance. In most cases low speed compression adjusters are a needle and seat which allows a small quantity of free flowing oil into the reservoir. 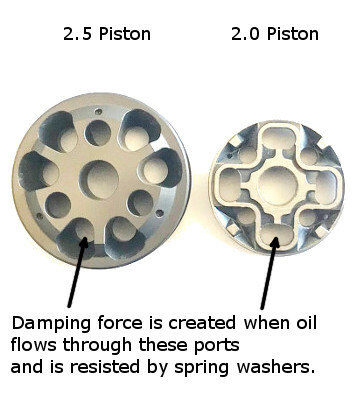 Once oil reaches a high enough speed and pressure it flows through a separate set of spring washers into the reservoir, referred to as the high speed circuit. High speed compression adjusters tune harshness and compliance on large hits such as potholes, whoops, and fast speed bumps. In most cases high speed compression adjusters take the high speed springs washers mentioned above and make it possible to tune the pressure at which oil will start to flow through the disks. By requiring higher pressure the high speed damping is increased. Mid speed compression adjusters have some impact on low speed and high speed compression, depending where in the adjustment range they are. Fully open the mid speed adjusters tune high speed a little bit, and fully closed they tune low speed a lot (each adjustment is a large increment). Mid speed compression adjusters are designed like a VERY LARGE low speed compression adjuster. They allow a large amount of free flowing oil when fully opened and allow none when fully closed. 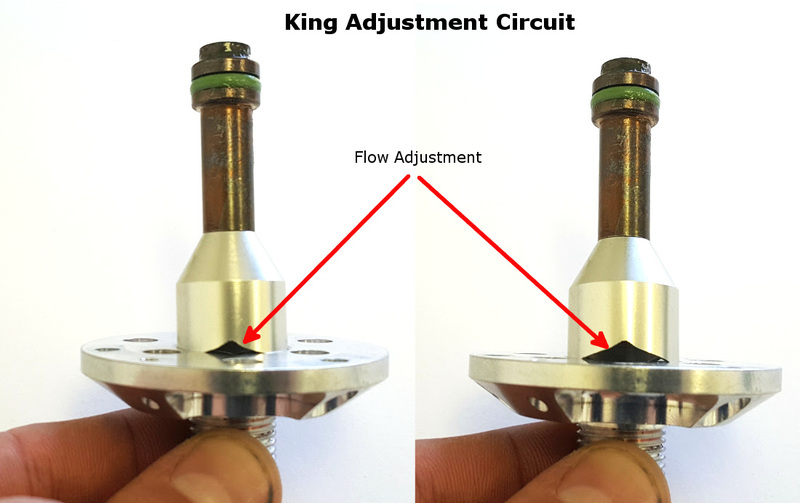 Oil not flowing through the adjuster passes through a set of spring washers. 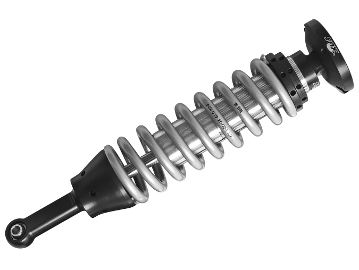 Compression adjusters allow you to easily and externally change the damping of your shocks. They are very useful if you’re adding weight for trips, picky about ride quality, or want to firm up that on road handling. Low speed compression adjusters are useful for on-road driving, and all types of off-road driving. High speed compression adjusters are most useful for high speed off-road driving. Mid speed adjusters are less effective than low speed or high speed adjusters and are useful for all types of on-road and off-road driving. Are Upper Control Arms Necessary For My Tacoma or 4Runner? Stock upper control arms on Tacoma’s and 4Runner’s are the first item to bind when the suspension extends. 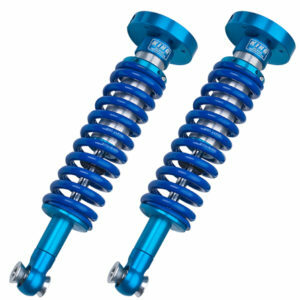 By replacing them with a tubular or billet arm the suspension is able to gain one inch of droop. One inch of travel may not seem like a lot, but many lifted Tacoma’s only have 2-3″ of droop, so that extra inch makes a big difference. When you don’t have enough droop the shocks will clunk hard against their extension stops and will feel very harsh on potholes, washboard, and any bump that requires more than two inches of movement. When the wheel has no down travel it can’t follow the terrain so it jerks the chassis down into the hole, then bangs back hard on compression when it hits the face of the obstacle. With sufficient down travel the tire smoothly follows the contour of the road. If you are lifting your Tacoma or 4Runner more than 1.5″ it is necessary to install an upper control arm to get the full benefits of the upgraded shocks. Do I need Extended Travel Rear Shocks? With an upper control arm installed the front of Tacoma’s and 4Runners pull about 10 inches of wheel travel, and in the perfect world the rear would have more travel in order to keep up. It’s ideal to have more travel in the rear than in the front because it is more subject to height changes when on the gas, and because it “follows along” and bottoming out the rear causes bucking. Stock height replacement 4Runner rear shocks have around 9″ of travel, which isn’t bad. 2-3″ of lift is very common in 4Runners and, when used with bump stops spacer allows the use of 9.5″ travel shocks. 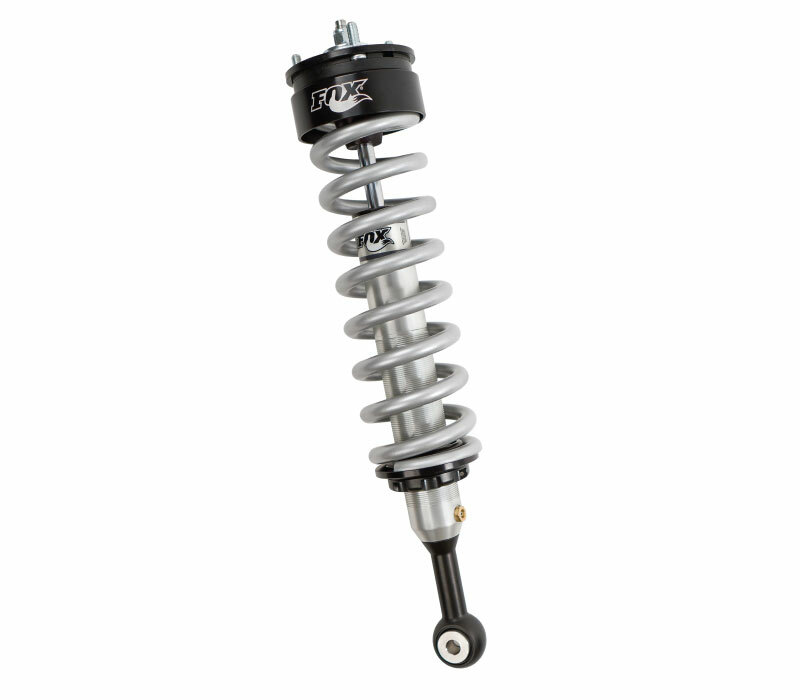 The most simple version are 2.0 diameter direct replacement 2-3″ lift shocks which require 0.5″ bump stop spacers. The next option is to use 2.5 Tundra rear shocks which we re-valve, clock the reservoir fittings, and swap bushings to fit on the rear of 4Runners. Tundra rear shocks require 1″ bump stop spacers to prevent bottoming out the shock. In order to fit 285/70R16, the most common 4Runner tire size, it is necessary to have at least 1″ of bump stop spacer to prevent the tire from hitting the fenders (individual needs may vary, always test flex to check fitment). For extreme off-roaders we can order custom length shocks which net you 11″ travel and require 2″ bump stop spacers. 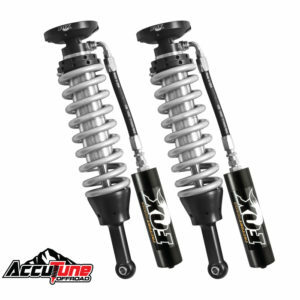 When using the extreme length shocks be sure to pair them with a spring capable of longer travel lengths or they may fall out. First gen Tacoma’s come with extremely short shocks that are different left to right, and it is impossible to pull decent wheel travel out of the rear using stock mounts. 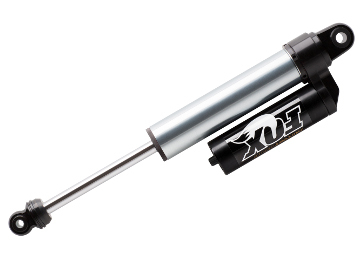 We recommend building custom rear shock mounts and installing universal fit 2.0 x 10″ remote reservoir shocks, also available with low speed compression adjuster. Second gen Tacoma’s have taller rear shock mounts, and travel is largely dictated by what spring pack you choose. Stock replacement 05+ Tacoma rear shocks have roughly 8.5″ of travel and are about the most you can get out of a stock leaf pack. Mini pack rear leaf springs work by replacing the overload with a small leaf pack which nets about 1.5″ of lift and an extra 2″ of droop. These leaf packs are an excellent fit with 2-3″ lift rear shocks mounted in the stock locations, using a 1″ bump stop spacer. Full replacement Tacoma Leaf Packs are capable of much more travel than mini-packs and there are a lot of options for shocks depending on what your goals are. Because replacement packs are capable of a lot more travel than stock, they should be set to deliver at least two inches of lift. For direct fit bolt on 2.0 shocks you’ll want to run a 2″ bump stop spacer and 3.5-5″ lift for almost 10″ of travel (that’s correct, most shock companies incorrectly list lift heights, give us a call and we’ll get you the longest shock that’ll fit correctly). For direct fit 2.5 shocks you will want to run our Tundra shocks converted to fit the rear of a Tacoma, these net you almost 10″ of travel. Ten inches of rear wheel travel is about the most you will get in the stock location without lifting the rear higher than the front. In order to use the full travel of aftermarket replacement leaf packs it is necessary to use a Tacoma rear shock relocation kit. 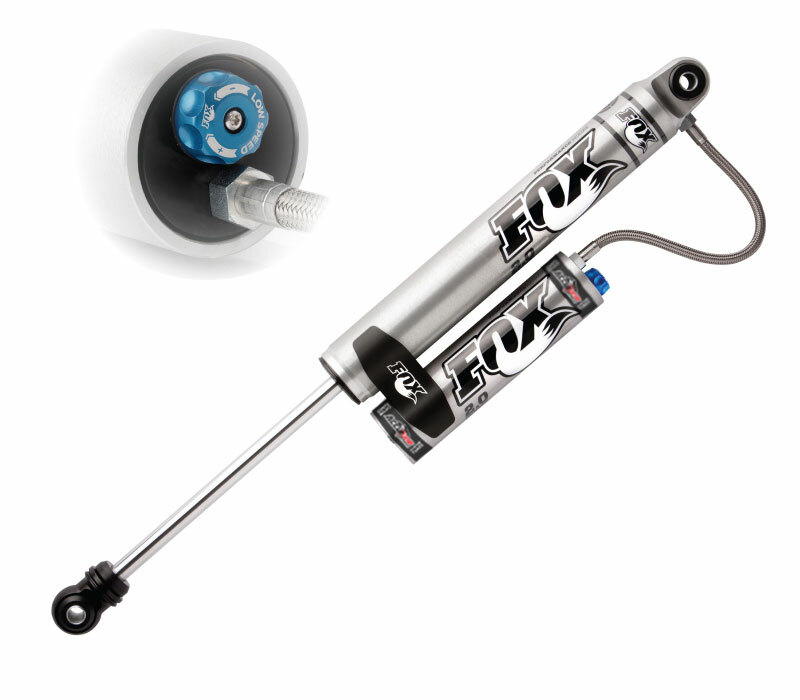 The kits allow you to install 2.0 or 2.5 shocks with 12-14″ travel. For most overland setups we recommend heavier leaf springs (Icon & OME Dakar) and 12″ travel shocks. For lighter setups looking to go fast off-road we recommend lighter leaf packs (Deaver, Atlas, Icon) and longer 14″ travel shocks. When choosing leaf packs you want the lightest rate that will carry your weight. Heavy Dakar springs on an stock weight Tacoma will not ride well, and light Deaver springs on a heavy overland setup won’t hold the weight consistently and may change heights substantially as the weight changes. The ICON RXT Tacoma leaf pack is nice because it’s adjustable and tuneable so you can set it up to meet your needs. The other benefit of shock relocation kits are that you don’t have to run as much bump stop spacer so you can gain extra up travel and droop travel, both of which are necessary for a comfortable ride. When it comes to oversize tires on Second and Third Gen Tacoma’s 285/70R16 is the most popular choice. In the rear 285’s require at least 1″ bump stop spacers to prevent the tires rubbing on the fenders. Your exact experience may be different based on wheel and tire combo so always flex test before hitting the trail. 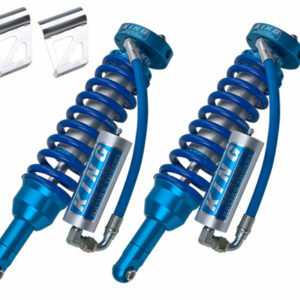 There are a lot of options for 4Runner and Tacoma rear shocks depending on rear spring choices. Bolt in fitment is the only option for 4runners. If you’re lifting the rear of the T4R maximize the travel by using aftermarket springs, longer shocks, and bump stop spacers. First gen Tacoma’s require universal fit shocks and custom mounts to get decent travel. There are tons of options for Second Gen Tacoma’s, but in general stock springs and stock springs with add-a-leafs should use the stock mounts. Aftermarket leaf springs are best used with a shock relocation kit. At AccuTune Off-Road we will custom tune all of them to deliver the ride you’re looking for. In the front & rear of Tacoma’s and 4Runners 2.0 IFP monotubes provide a more comfortable ride than twin tubes and OEM replacement shocks, and work well for street driving and exploring the backwoods at a normal pace. 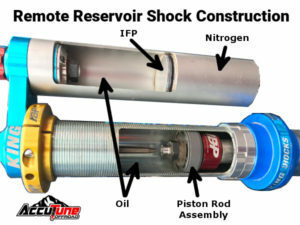 2.0 Remote Reservoir shocks are available for the rear of Toyota 4Runner’s and Tacoma’s. The added gas space improves heat capacity and durability making these shocks excellent for exploring the backwoods, blasting fire roads at speed, and prerunning. 2.0 Remote Reservoir shocks with compression adjusters increase damping capability, and make it easy to adjust the suspension for more control or more comfort. They’re also a great way to help your suspension cope with added weight when loading up for trips. 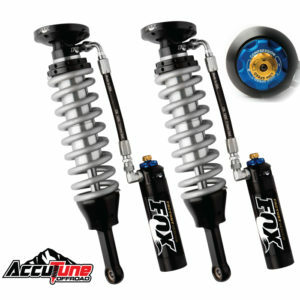 2.5 IFP Monotube shocks are only available for the front of Taco’s and 4Runner’s. The increased size makes them a great choice for heavier Toyota’s doing slower speed overlanding. This is also the first size shock available in extended length configurations for use with long travel upper control arms. In the front of 4Runners and Tacoma’s 2.5 Remote Reservoir shocks are the first shock on this list able to handle tough off-road terrain at speed. The large size provides the damping and heat capacity necessary, and the remote reservoir configuration ensures a long life and better ride quality. In the front these are great for exploring and overlanding on washboard at speed. These are also suitable for use on fast fire roads and whoops. 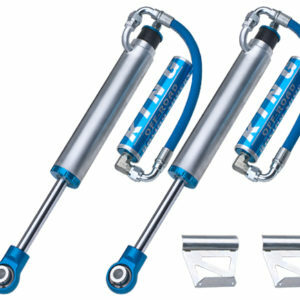 In the rear, 2.5 Tacoma Remote Reservoir Shocks are able to withstand hard use and heavy loads. If you’re carrying a lot of weight such as a roof top tent, weekend gear, and more then this is the appropriate size for you. You’ll be able to tackle tough terrain without slowing down and without blowing out your shocks. These are the go to shocks front and rear for people wanting to use heavy overland rigs on difficult off-road terrain at reasonable speeds with good reliability and a comfortable ride. On stock weight Tacoma’s and 4Runner’s 2.5 Remote Reservoir Shocks with Adjusters will let you tackle washboard, whoops and more at high speed for long periods of time. https://accutuneoffroad.com/wp-content/uploads/Tacoma-Shock-Size-Article.jpg 100 100 Ryan https://accutuneoffroad.com/wp-content/uploads/AccuTune_Offroad_logo.png Ryan2018-01-22 14:01:192019-03-25 14:24:25What Size Tacoma/4Runner Shocks Do You Need?